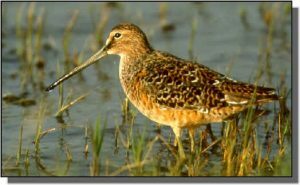 Description: Similar and often indistinguishable from the Short-billed Dowitcher, this dove-sized shorebird has a long, straight, black bill and light green legs. Breeding birds are deep reddish-rufous below and heavily mottled buff and black above. Nonbreeding birds are dull gray-brown. The sides and underbelly are often barred. In flight, a white diamond pattern on the back and prominent bill are characteristics of dowitchers. The vocalization is usually a single or repeated “peep” or “keek” call. They feed by probing, often appearing stationary, in an oil pump fashion. Females have a longer, slightly drooped bill. Similar Species: Unlike the Wilson’s Snipe, dowitchers do not have a striped appearance. Stilt Sandpipers are less robust in appearance. 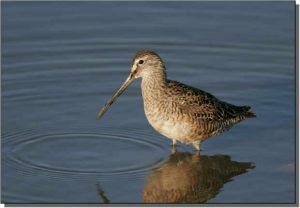 To distinguish from the Short-billed Dowitcher, listen for the call and look for the barring (as opposed to spots) along the sides and underbelly and a more rounded back during feeding. Comments: During the fall migration, Long-billed Dowitchers appear in the Great Plains during July and continue through late fall. They breed on the tundra and winter in fresh and saltwater marshes and mudflats both in coastal areas and inland throughout southern North America and Central America.